This Ovo floor lamp comes in a designer Mellow Coral color and is paired with a glass tray table that’s perfect for drinks, TV remotes, and more. 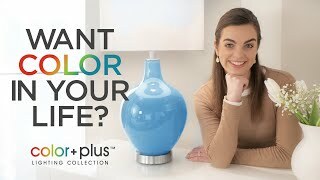 Add designer style to your home with this tray table floor lamp design from the Color + Plus™ collection. The clear glass tray table offers a handy spot to place a TV remote or your favorite beverage. 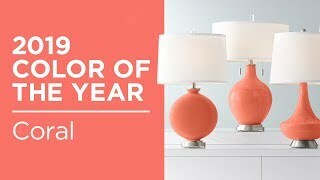 Below the tray, the lamp base stands beautifully in our designer Mellow Coral color. A white fabric shade completes the look up top. Custom made to order lamp design. Lamp base U.S. Patent # 8,899,798. Designer Mellow Coral color base. Brushed nickel finish accents. White fabric shade.